Back in the 70s, when I was smoking a lot of pot, I assumed that it would become legal once the baby boomers gained political power. However, instead of being legalized, this drug which I had found to be relatively harmless remains listed as a Schedule I controlled substance, prime target in that international catastrophe called the War on Drugs. According to a Quinnipiac Poll, over half the voters in Ohio favor allowing adults “to legally possess small amounts of marijuana for personal use.” Given this, you would think that some opportunistic, politically astute legislators would get to work on a bill to do just that. However, this does not seem to be about to happen any time soon. Fortunately, Ohio has a remedy for such inaction: the ballot initiative. Some entrepreneurs looked at this situation and saw an opportunity. 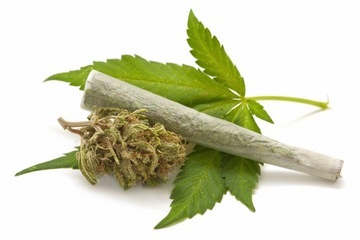 Following the lead of Colorado and Washington, they put together a ballot initiative to legalize marijuana. Like the entrepreneurs who managed legalizing casino gambling in Ohio, they crafted a document that would give control over the industrial production of marijuana to a limited few, who happen to be those who sponsored the ballot initiative. They formed an organization, called “ResponsibleOhio”, consisting 10 investors or partnerships who each put up $4 million, mostly to fund the campaign. They succeeded in collecting enough signatures to get the issue on the 2015 ballot, where it will appear as Issue 3. If the initiative fails, they stand to loose a bundle, but if it passes, they get a huge payoff. If you were an investor used to backing startups, this might appear to be a good opportunity. Except for the crass attempt to grab financial control over the new industry, ResponsibleOhio has crafted a thorough and reasoned solution to a very complex problem. Key to their approach is the establishment of a new state agency, the “marijuana control commission,” to regulate the new industry. The ballot issue explicitly addresses medical marijuana, retail establishments, taxes, and a host of other concerns. Of course, banking services for this semi legal industry will be problematic, and if the federal government decides to put its foot down, all this is for naught. However, in general Issue 3 appears to leave enough flexibility in the new commission and in the legislature to enable Ohio to successfully manage the change. In contrast, one can look at the document put forward by “Responsible Ohioans for Cannabis”, which seems to be the stoner’s version of marijuana legalization. This problem is bad enough with alcohol. People don’t want to have a significant increase in accidents caused by driving while under the influence, whatever the drug involved. In Washington state, the framers of the legalization initiative addressed this issue by specifying the amount of THC that a driver could have in his blood stream and still drive legally: 5 nanograms per milliliter. This is so low that many saw it as a way to re-criminalize the medical marijuana. Evidently, theses guys see no reason to coddle the up-tight drivers of Ohio. The version actually on the Ohio ballot addresses the problem by declaring it illegal to drive or operate heavy machinery while under the influence of marijuana, and mandating that the General Assembly write laws to enforce this. Since this, like all direct ballot initiatives in Ohio, is an amendment to the constitution, it is reasonable to allow the legislature some authority in the details, like setting the legal limits for THC in the blood stream. I have not encountered any complaints about this part of the amendment. This is a complex ballot initiative. The summary that appears on the ballot is over a page, and the one provided by Yes On 3 is much longer. There is one detail that the Republicans in charge thought not important enough to include on the ballot, but concerns people who deal with teenagers, especially in the minority community. It increases the penalties for selling marijuana to minors, adding “child endangerment” to the offense. Of course, most of those selling to minors will be minors themselves. So the proposed amendment doubles down on the failed strategy of trying to control the black market by putting more people in jail, though it limits the target to the young. This seems mean-spirited, and it is sure to have negative consequences. I would like to see this language changed. Unfortunately, one of the problems with a ballot initiative is that it is very brittle. You cannot amend it. You have to take or reject the whole thing. In general, I have no quarrel with speculative investors trying to get a return. However, I cannot stomach using the Ohio Constitution as fodder for an investment scheme. 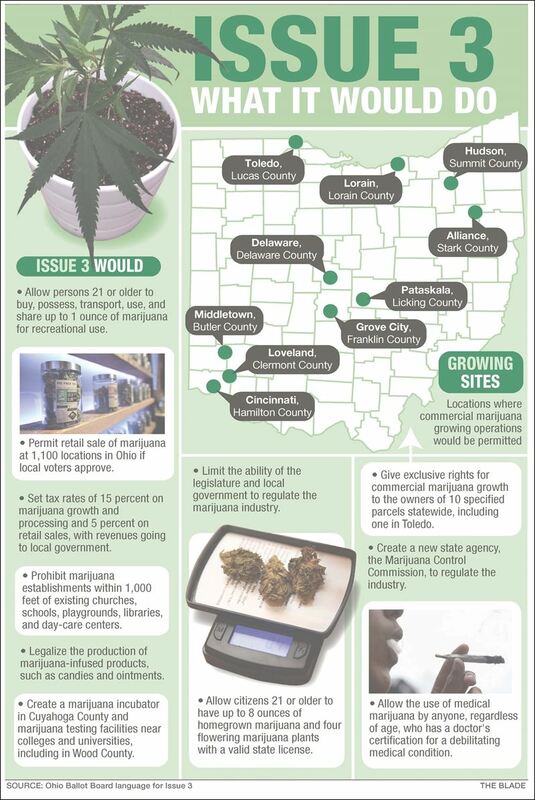 It is time for the Ohio chapters of the ACLU, NORML, the Green Party, and the Libertarians to get together and craft something they can all support. These groups are not used to having enough political power to get anything done, and consequently, not used to having to compromise. However, as long as the pro-legalization community remains fragmented, Issue 3 might be the best we can hope for. Welcome to direct democracy. What a mess. For myself, this is a painful decision. I adamantly support legalizing marijuana, but I am angered by the blatantly corrupt constitutional amendment that is before us. I am tempted to vote for both Issues 2 and 3, hoping they both pass and letting it get sorted out in the courts. The phrase “careful what you wish for” comes to mind. I have concluded that giving special privileges to a select few is destructive to our democracy and that the people of Ohio can come up with a better proposal to legalize marijuana. I will Vote NO on Issue 3, YES on Issue 2.